The Cumberland & Dumfriesshire Farmers Mart P.L.C. had forward 3,007 store hoggs & 1,512 in lamb sheep at their weekly sale at Longtown on Tuesday 23rd February 2010. Store hoggs still good to sell. Top of £82.20 for Texels from Redbanks, £78.80 Bloch, £78.50 Ridley Stokoe; Suffolk £78.20 Cowcorse Cottage, £76.80 Bloch, £75.20 Hardhurst; Greyface £76.20 Mains of Collin, £74.50 Low Greenends, £74.50 Swinside; North Country Cheviot £72.50 Philiphaugh; Blackface £65.50 Cacrabank, £62.20 Castlenook; Cheviot Mule £64.50 Dinley; Hill Cheviot £61.50 Skelfhill, £61.20 Girnwood, £60.50 Priesthaugh; Swaledale £52.50 Low Greenend; Herdwick £43.50 Middle Row. 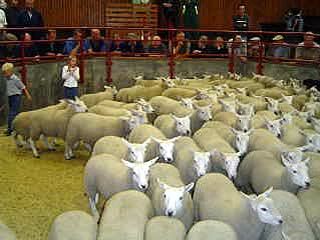 Cast ewes to £124 for a Texel from Redbanks, hill types to £57.50 Carpet Farm, cast rams £79 Ridley Stokoe. The special sale of in lambers included a dispersal of 475 head from Mr P.R. Smith, Cocklake House, Penruddock, Penrith. Many buyers were present, all classes easy to sell with vendors well pleased. Top of £138 for in lamb Texel cross hoggs from West Mill Hills; Suffolk Mules £137 Tone Hall; Greyface £124 West Mill Hills. In lamb ewes to £130 and £128 for Texels from Cocklake House; Greyface £105 Greenknowe, £103 Cocklake House; North Country Cheviot £98 Priesthaugh, £93, £92 (5 pens) Cocklake House; Blackface £76, £75 Eyecott; Swaledale £72 Crook. Geld ewe hoggs to £120 for Texels from Drinkstone.